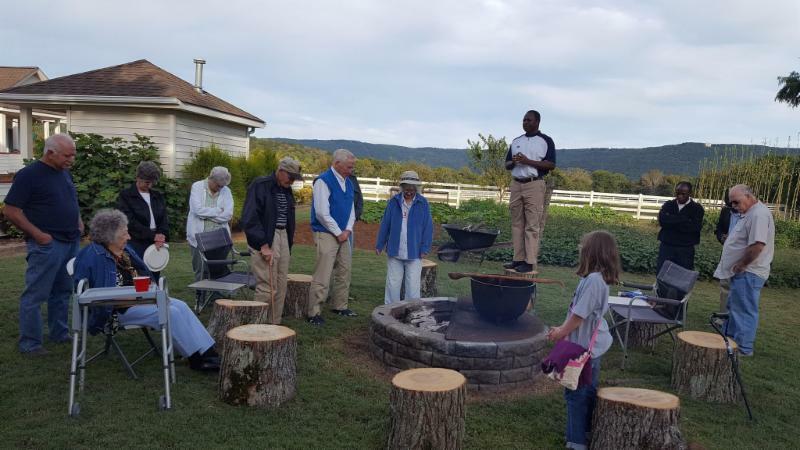 Bishop John's Visit, Bell Tower Dedication, Fall Cookout, and more! "Pastoral Visitation of the Bishop of Tennessee"
On Sunday, October 28th, St. Agnes' Episcopal Church in Cowan will welcome The Rt. 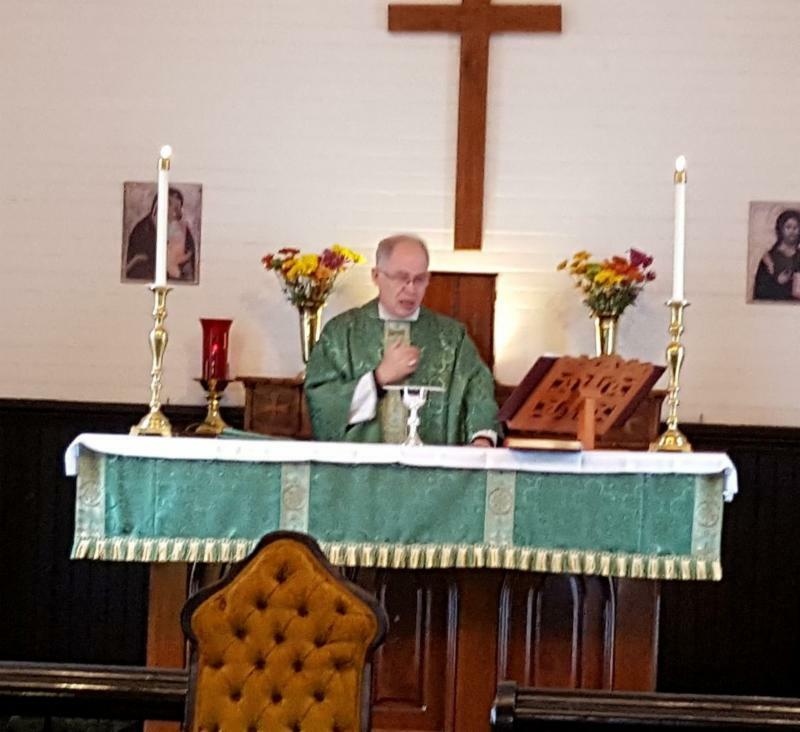 Rev'd John C. Bauerschmidt, 11th Bishop of Tennessee, for his annual pastoral visitation. We hope everyone in the congregation can make it for this special time together as bishop and congregation! It's also a good occasion to invite a friend or neighbor to visit the church and worship with us. The service will begin at the usual 11:00 a.m. Bishop John will lead the service and we will celebrate Holy Communion. Immediately afterward the congregation will ask the bishop to recognize the 40th anniversary of our church bell tower and to dedicate it in memory of Mr. Robert Stuart Sloan. We will go from there to our annual church cookout at the Pearson farm and continue our time of fellowship with the Bishop. This year we scheduled our Annual Cookout to coincide with Bishop Bauerschmidt's visit on October 28th. We will gather as before at the Pearson farm and enjoy an afternoon of fun and fellowship. The late October date should be the perfect time for hot stew on the open fire! And this year our view of Sewanee mountain may be enhanced this year with the colors of fall! 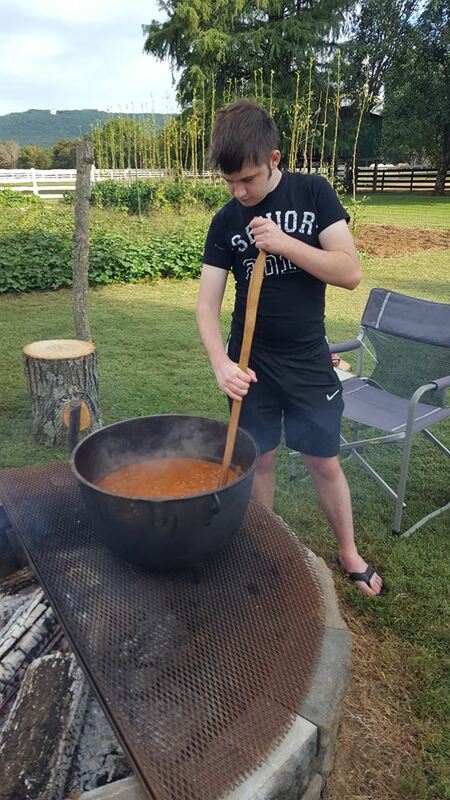 The Pearson's are getting the stew together. Others can bring cornbread, rolls, salads, desserts, and other fixin's that will enhance this beautiful get-together. The Pearson's are located at 5516 Georgia Crossing Road. We will gladly provide written driving directions to anyone who needs them. 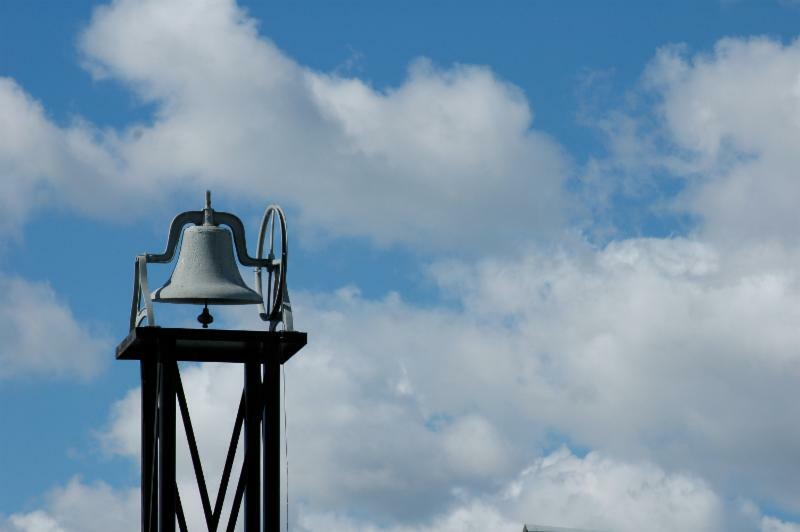 This year, St. Agnes' recognizes the 40th anniversary of our bell tower. The 24-foot bell tower was built in 1978 at the direction of Mr. Robert Stuart Sloan. Mr. Sloan was an extraordinary member of St. Agnes'. In the early days of the congregation we were an unorganized "preaching station". As such, we had no local church officers. All of our church-related business was managed out of the diocesan office at St. Mary's Cathedral in Memphis, and we did not have elected delegates representing us at the convention of the Diocese. He also represented St. Agnes' as a delegate to the annual convention for many years. In 1957 he led a petition to get St. Agnes' upgraded again to from a mission station to an organized mission with a locally elected mission council. Indeed, Mr. Sloan accomplished many great things at St. Agnes', but we believe that his proudest moment was the completion of our bell tower. As you may recall, the nave at St. Agnes' originally belonged to Church of the Ascension in the Shiloh community near Murfreesboro. When that church closed in the early 1890's, Bishop Gailor gave the building to the congregation in Cowan, which was meeting in a house at the time. The building included a rooftop belfry. 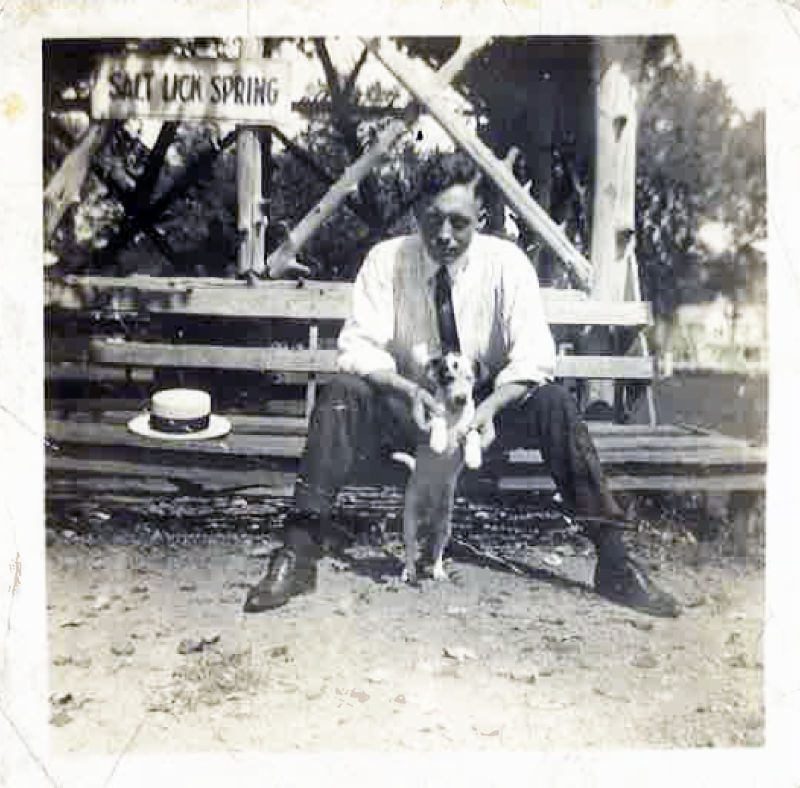 Mr. Sloan, as a young boy, rang the bell to announce church services and Sunday school. The bellfry and the 500-plus pound bell were entirely too heavy for the roof of the building, and so they were removed in the early 1930's. (Our infamous copper cross built out of an old moonshine still was installed in its place.) The bell was placed under the floor of the nave and soon forgotten. When the Nave received a central heat unit in the early 1970's, the old bell was rediscovered along with two other bells. (Nobody knows how we ended up with three!) Mr. Sloan led the charge to get the bell that came out of the old bellfry restored and put back into use. The two smaller bells were sold and the proceeds used to restored the largest one. Mr. Sloan, an investor in Rigsby Wrecker Service, got help from Clifton Rigsby, Jr., Clifton Rigsby, III, and Mr. J.L. Hanes to hoist the bell onto a newly constructed 24-foot tower. Bob then had the honor of ringing the bell again in June of 1978 for the first time since it was placed in storage. The local newspaper was on hand to witness the event. Click here to read a rough scan of the June 29, 1978 newspaper article. At the completion of our Sunday service on October 28th, we will ask Bishop Bauerschmidt to dedicate our bell and bell tower in loving memory of Mr. Robert Stuart Sloan. We treasure his memory to this day, and we are grateful for his dedication to the mission and ministry of St. Agnes' Church in Cowan! 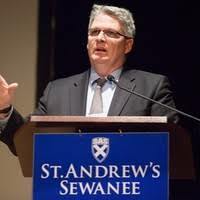 Mr. Karl Sjolund, Head of School at St. Andrew's-Sewanee, will also visit St. Agnes' on October 28th. Karl is coming to witness the dedication of our bell tower partly because of Mr. Robert Sloan's legacy with education on the Mountain. Bob Sloan attended Sewanee Military Academy from 1910 until 1913. In years following he and his wife, Mrs. Ozelle Barnes Sloan, sponsored other students from Cowan to attend the various schools on the Mountain. The Sloan's were also faithful contributors to the Century Club at The University of the South. Karl is also coming because St. Agnes' has more SAS-related alumni than any other rural mission ccongregation in the Diocese of Tennessee. We look forward to his visit and hope we will continue building our relationship with St. Andrew's-Sewanee. Howard Gene Eslick was treated for pneumonia, and then had to spend a week in a senior facility due to readjust his routine for medication. He is back at The Waters of Winchester and feeling better. Betty Haney had a recent fall resulting in a foot fracture. Fortunately she is able to walk and get through her day without excessive pain or the need for medication. Her recovery time will be longer than normal because of her concurrent recovery from cancer treatments and rebuilding her immune system. She appreciates our prayers and phone calls. Linda Milligan had surgery and is recovering at home. Her recovery is slower than expected, so please send her some prayers, cards, and phone calls. Linda's address is 215 Hines St., Cowan, TN 37318. Morris Robertson, Shelia's father, is under the care of home health. Shelia reported that everybody in the family is taking turns caring for him and seeing that his needs are met. It has been a difficult few months for everybody, but they're all working together. Please keep them in your prayers! George Wilkinson is undergoing tests and waiting for results to determine his plan of action. We need to keep up our prayers, visits, and phone calls so that George has all of the encouragement he can get to move forward and feel better. We have a wonderful resource by our side when disaster and disease take their terrible toll: Episcopal Relief and Development. Please take a moment and consider a contribution to their efforts. As you can imagine, Hurricane Michael and other recent disasters are requiring a large amount of money and resources to meet the urgent needs of others. With sadness we report that Alexis Mauldin , a former parishioner at St. Agnes' and a dear friend of the congregation, passed away on Friday, October 6th. Alexis struggled with ALS-related health problems in the last few years. Thankfully, she was able to spend her final months with her family in Texas. Please remember them in your prayers. Jeff Johnson , Vice-President of Mountain Valley Bank, passed away suddenly and unexpectedly on Monday, October 8th. Please pray for his his family and his colleagues in this extremely difficult time. George and Andy's cousin, Mary Kay McBee , passed away on Tuesday, October 16th, following an extended illness. The funeral service will be held on Saturday, October 20th, 2:00 p.m. at Moore-Cortner Funeral Home. Please remember the entire Wilkinson family in your prayers. "Rest eternal grant to them, O Lord: and let light perpetual shine upon them. May their souls, and the souls of all the departed, through the mercy of God, rest in peace. Amen." Julius Mauro, Sandra Langston, Jerry McCaleb, Morris Robertson, George Wilkinson, Andy Hill, Kim Piper, Jacqueline Boyanton, Joe Money, Tom Tucker, Baby Elijah Green, John Kastrinos, Royana Stewart, Kurfees Boswell, Erma Little, Wynona Gibson, Tammy and Victoria Keese, Sue Hill, Celeste Simmons, Carter and Judy Smith, Fran Perry, Joe Ed Williams, Lamar Davis, Jimmy Moss, Bill Keller, Howard Gene Eslick, Benny and Betty Haney, Linda Milligan, Karen McCallie, and Subamma (our sponsored child). We pray especially for the victims of Hurricane Michael in Florida and South Georgia.